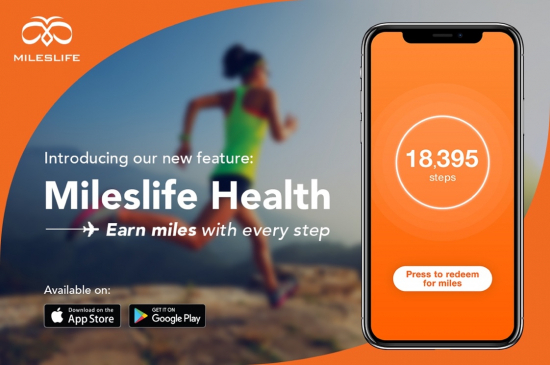 SINGAPORE – Mileslife, the first app where users can earn miles from dining and everyday spending, has recently launched their latest initiative – Mileslife Health. 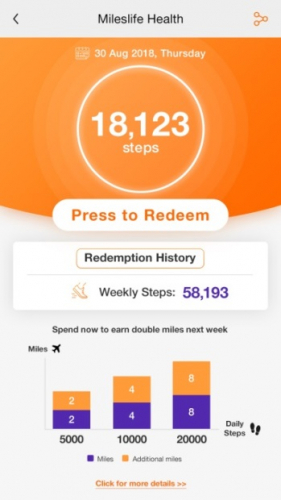 The new function rewards users with bonus miles upon completion of activity targets in a bid to motivate Singaporeans to hit their recommended step count every day, starting from 5,000 steps onwards. According to data from the Health Promotion Board (HPB), the average Singaporean today is heavier and Singapore is at risk of hitting obesity rates of 15% by 2024. People who are obese are at higher risk of developing health problems such as diabetes, heart disease and stroke. To help tackle this emerging issue and play its part for the community, Mileslife is encouraging users to take the first step towards exercising by walking for miles. One of the easiest ways to exercise, walking requires nothing more than 30 minutes of one’s time daily and a pair of tennis shoes, while having tremendous mental and physical benefits. A minimum of 5,000 steps is required each day to redeem airline miles with the next tier of rewards at 10,000 and 20,000 steps. The more you walk, the more miles you’ll earn. Steps will be reset at midnight each day; miles must be redeemed in the Mileslife app before midnight SGT (UTC +8). An additional 10 miles will be awarded every week if the number of accumulated steps redeemed in one week exceeds 100,000 steps. On top of earning miles from hitting the daily steps target, double the miles when you spend with the Mileslife app. Full terms and conditions are available on the app. Download the app at http://bit.ly/MileslifeHealth. Mileslife is the first app for consumers to earn airline miles and points directly through their everyday lifestyle and travel spending and help the local business to target potential high-calibre customers. It has created a better ecosystem to connect airlines, merchants, banks and consumers, who are also able to earn accelerated miles from their everyday spending, both from Mileslife and their own credit cards. Mileslife launched in China in March 2016 and subsequently launched in Singapore and Hong Kong in June 2017 and August 2018 respectively. Mileslife offers more than 20,000 restaurants, premium spas, global luxury and boutique hotels, high-end retailers, and activities in Singapore, China and Hong Kong, with many other cities coming soon.